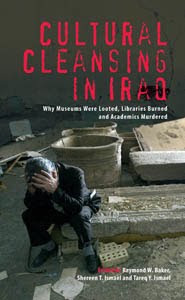 Professor Roger Matthews of the Institute of Archaeology at University College London has reviewed Cultural Cleansing in Iraq in "Battle to destroy hearts and minds" the Times Higher Education April 1, 2010, 52 [THE]. Today, the discipline of Mesopotamian archaeology lies in tatters; Iraq's universities and its antiquities service face an uncertain future in the midst of a harrowing present; standards of education, literacy and international engagement have plummeted to levels unknown in the history of Iraq; and the world continues largely to turn its back on calls for assistance from our Iraqi friends and colleagues. All this in a country renowned throughout the Arab world and beyond for its sophistication and open-mindedness, epitomised in the Arabic saying "Cairo writes, Beirut publishes, Baghdad reads".